Sweetness and Twang describes the unique style in which Aimee Fletcher lends her heart and voice to a song. Accompanied by the authentic gut-wrenching vocals, unswerving harmonies and intrinsic spaghetti-western inspired guitar licks of her husband Fletch, Sterling Fletcher has created their own brand of Y'all-ternative which has earned them critical praise and fan allegiance. As performers, Fletch and Aimee have been acknowledged with the Association for the Promotion of Campus Activities National Best Band Award three times and they continue to inspire audiences with their fiery chemistry and bona fide stage presence. 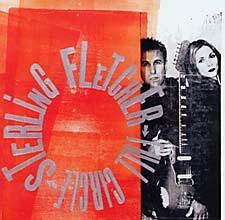 During a recent radio promotion and tour, Sterling Fletcher shared the stage with such notable Americana heroes as Buddy and Julie Miller, Gillian Welch and Steve Earle. 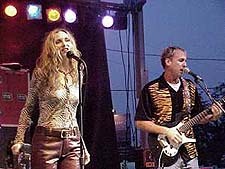 Also, the retro-country ditty, The Only Pearl; which appeared on their CD, Full Circle, on Uncle Am Records; received airplay which placed them in the top 100 on the Americana Radio Chart. They return to the studio later this year to begin work on a new project which will feature a cast of stellar musicians. Please continue to surf our web site for updates and more info on the band. Listen now to clips from the CD - FULL CIRCLE.